We consider worship to be a great privilege. God is our Creator, He made us and knows everything about us. Incredible as it may seem mankind actually despises God, as we did as well. But God has been gracious to us and given us a desire to worship Him, not because of anything in us but because of His love. What better way to start the week than to join with other people who have been given the same desire to glorify and enjoy God in worship. Read More. We gather mainly from in and around the Larne area. 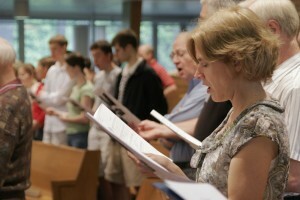 The congregation is composed of older Christians, families, workers, students and children. Our fellowship is not large but we seek to demonstrate true Christian love. It is always our hope to be “speaking the truth in love” (Eph. 4:15).